Bok choy is one of the better anti-inflammatory foods in the world. It’s a type of Chinese cabbage, and it belongs to the family of cruciferous vegetables that also includes collard greens, kale, and broccoli. Other names for bok choy are pak choi, pok choi, and Chinese white cabbage. There are many benefits of eating bok choy. For example, some of the reported health benefits of bok choy include preventing and treating cancer, promoting heart health, strengthening bones, promoting skin and eye health, boosting immunity, and benefiting those with type 2 diabetes. What are the nutrition facts of bok choy? The key nutrients in bok choy that make it such a heavy hitter include vitamin A, vitamin C, and vitamin K. One cup of cooked bok choy contains 144% of the recommended daily value (DV) of vitamin A, 74% DV of vitamin C, and 72% DV of vitamin K.
Other vitamins in bok choy include vitamin E, vitamin B1, vitamin B2, vitamin B3, vitamin B5, vitamin B6, folate, choline, and betaine. Bok choy is also a decent source of fiber and protein. From a mineral perspective, in bok choy, you will also find calcium, potassium, iron, magnesium, phosphorus, manganese, zinc, copper, and selenium. The following is a detailed bok choy nutrition chart with information for one cup, or 170 g, of cooked and shredded bok choy. What are the health benefits of bok choy? Bok choy benefits people with type 2 diabetes, for instance. It also boosts immunity, strengthens bones, improves vision, lowers blood pressure, reduces inflammation, improves skin health, and prevents and treats cancer. In this section, we will take a deeper look at these bok choy health benefits. Bok choy and other cruciferous vegetables contain anti-cancer properties that help lower the risk of prostate, lung, ovarian, breast, colorectal, and colon cancers. Bok choy is loaded with beneficial antioxidants like vitamin C, vitamin E, lutein, sulforaphane, zeaxanthin, isothiocyanates, indole-3-carbinol, and thiocyanates. The nitrile, indole, and sulforaphane are effective against cancer because they inactivate carcinogens and protect cells from DNA damage. The brassinin in bok choy also has chemo-preventative and antioxidant properties that help protect against cancer. A 2012 study found that eating cruciferous vegetables like bok choy reduced breast cancer risk by 27% to 62% in nearly 5,000 Chinese breast cancer survivors. Other studies show that the consumption of multiple servings of cruciferous vegetables weekly results in a lower risk of colorectal, lung, breast, and prostate cancer. The calcium, magnesium, and potassium in bok choy help reduce blood pressure naturally. Potassium also processes sodium, which can reduce sodium damage on the cardiovascular system. The vitamin K in bok choy is also needed for blood clotting. The folate and vitamin B6 in bok choy also help prevent the accumulation of homocysteine. This is important because excess homocysteine is thought to lead to heart problems and damage blood vessels. The vitamin K and omega-3 fatty acids in bok choy help reduce the risk of inflammation, which can lead to a number of health conditions. The polyphenols in bok choy can also lower inflammation, while the choline in this cruciferous vegetable reduces inflammation. The vitamin C in bok choy helps grow collagen—a protein necessary for hair and skin health. The collagen helps improve complexion and smooth wrinkles. Vitamin C is also an excellent antioxidant that may prevent skin damage due to smoke, pollution, and the sun’s UV rays. The antibacterial properties of bok choy also help combat skin problems like eczema and acne. The antioxidant power of vitamin C in bok choy is also needed to boost the immune system. Moreover, the selenium in bok choy stimulates killer T-cell production, and this can prevent illnesses due to invading viruses and bacteria. 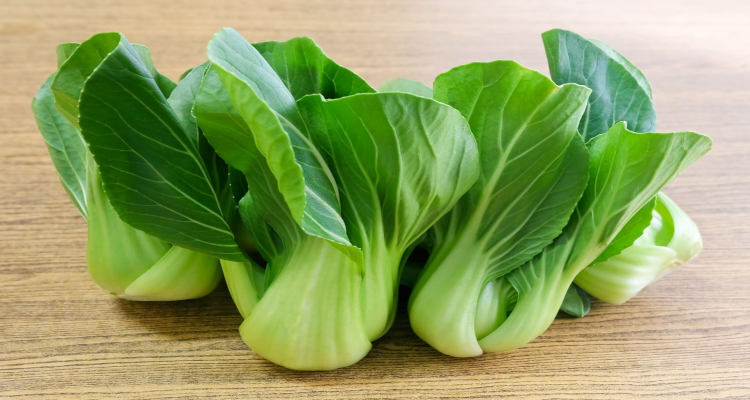 Bok choy is loaded with nutrients beneficial for bone health, including magnesium, phosphorus, calcium, zinc, iron, and vitamin K.
Vitamin K reduces fracture rates and increases bone density in those with osteoporosis. Phosphorus and calcium are also key minerals found in teeth and bones. The iron and zinc help with the growth and production of collagen. Some research suggests that cruciferous vegetables like bok choy can help those with diabetes reduce their blood sugar levels. That being said, a 2018 meta-analysis published in the British Journal of Nutrition concluded that evidence for cruciferous or green leafy vegetables reducing type 2 diabetes wasn’t as convincing as it could have been. However, bok choy is very low on the glycemic index and it should definitely be included in an anti-diabetes diet. The high amount of beta-carotene and vitamin A in bok choy can help prevent cataracts, treat dry eyes, improve low-light vision, and treat macular degeneration—an eye condition that causes vision loss. Although there are many benefits of bok choy, there are risks to consider as well. For example, bok choy is often considered goitrogenic, and this means it contains chemicals that interfere with thyroid hormone production. Raw bok choy contains an enzyme called myrosinase, which can delay thyroid function and prevent the body from absorbing iodine. There is a case where a person developed severe hypothyroidism with myxedema coma and respiratory failure after consuming two to three pounds of bok choy daily for several months. Cooking bok choy will deactivate myrosinase and reduce sulforaphane levels. Overall, the risk of thyroid suppression becomes neutralized, but it also reduces its anti-cancer benefits as well. Eating raw bok choy in small amounts is likely not an issue. In a few circumstances, goitrogenic foods have shown to have a negative effect on thyroid health; however, the beneficial nutrients in bok choy outweigh the thyroid risks. Also, since bok choy is high in vitamin K, people taking blood-thinners like warfarin should not suddenly change the amount of vitamin K they take in from food. Bok choy is also a great vegetable to grow in your garden, especially in the spring and fall when the weather is cool. Bok choy is best grown when seeds are planted in the garden soil, or you can start the seeds inside until the seedlings are ready to transplant outside. When planting bok choy indoors, start before the last frost, and then transplant it two weeks later. Bok choy is able to withstand cooler temperatures since it is a cold weather vegetable. Bok choy requires rich and loose soil, so fertilize bok choy early after you plant it. Once seedlings are four inches tall, thin bok choy to six to 10 inches apart. You can plant bok choy early in the season, and plant a second crop later in the summer for a fall harvest. It takes 45 to 50 days for a bok choy plant to fully mature; therefore, you can get two crops per year. Be sure to remove weeds from your garden on a regular basis. Bok choy is an excellent anti-inflammatory food high in vitamin A and vitamin C. As a result of its nutrition, the health benefits of bok choy include treating and preventing cancer, lowering blood pressure, strengthening bone health, boosting immunity, improving eye health, and more. How do you include bok choy in your diet? Bok choy can be eaten raw in a salad, grated to make curry, fried into stir-fry, boiled in soup, pickled to make kimchi, shredded into a coleslaw, steamed and made into a vegetable dish, cut and grilled with salt, and sautéed with broth. If you love gardening you can also grow bok choy at home. “Bok Choy: A Top 3 Nutrient-Dense Vegetable that Battles Cancer,” Dr. Axe; https://draxe.com/bok-choy/, last accessed September 17, 2018. “Cabbage, Chinese (pak-choi), cooked, boiled, drained, without salt Nutrition Facts & Calories,” SELFNutritionData website; http://nutritiondata.self.com/facts/vegetables-and-vegetable-products/2378/2, last accessed September 17, 2018. Ware, M., “The Health Benefits of Bok Choy,” Medical News Today, last updated Aug. 22, 2018; http://www.medicalnewstoday.com/articles/280948.php, last accessed September 17, 2018. “9 Impressive Benefits of Bok Choy,” Organic Facts; https://www.organicfacts.net/health-benefits/vegetable/bok-choy.html, last accessed September 17, 2018. “Bok Choy Nutrition Facts,” Nutrition-and-You.com website; http://www.nutrition-and-you.com/bok-choy.html, last accessed September 17, 2018. “Eating cruciferous vegetables may improve breast cancer survival,” ScienceDaily, April 3, 2012; https://www.sciencedaily.com/releases/2012/04/120403153531.htm, last accessed September 17, 2018. Chen, G., et al., “Green leafy and cruciferous vegetable consumption and risk of type 2 diabetes: results form the Singapore Chinese Health Study and meta-analysis,” British Journal of Nutrition, May 2018; 119(9): 1057-1067, doi: 10.1017/S0007114518000119. Taylor, J., “Bok Choy & Hypothyroidism,” Livestrong, October 3, 2017; https://www.livestrong.com/article/555273-bok-choy-hypothyroidism/, last accessed September 17, 2018. Mierzejewski, K., “Planting Bok Choy: How to Grow Bok Choy,” Gardening Know How; https://www.gardeningknowhow.com/edible/vegetables/bok-choy/planting-bok-choy.htm, last accessed September 17, 2018.